When it comes to unique hoop earrings there are many more designs than just the classic hoops. Traditionally, hoops are simple circular earrings that can have different sizes. However, the jewelry word is creative and it has taken the hoop earrings design to a completely new level. If you are planning to buy fashion earrings but don’t know where to start, stay with us. 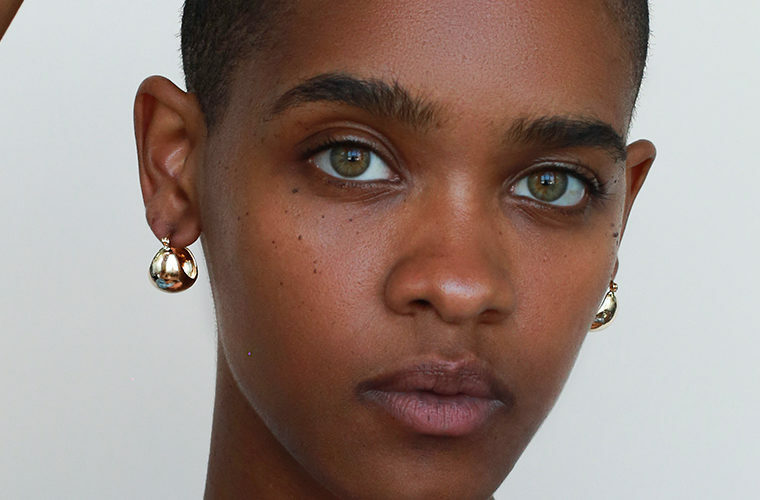 Read further to discover five unique hoop earrings designs by Ana Luisa. 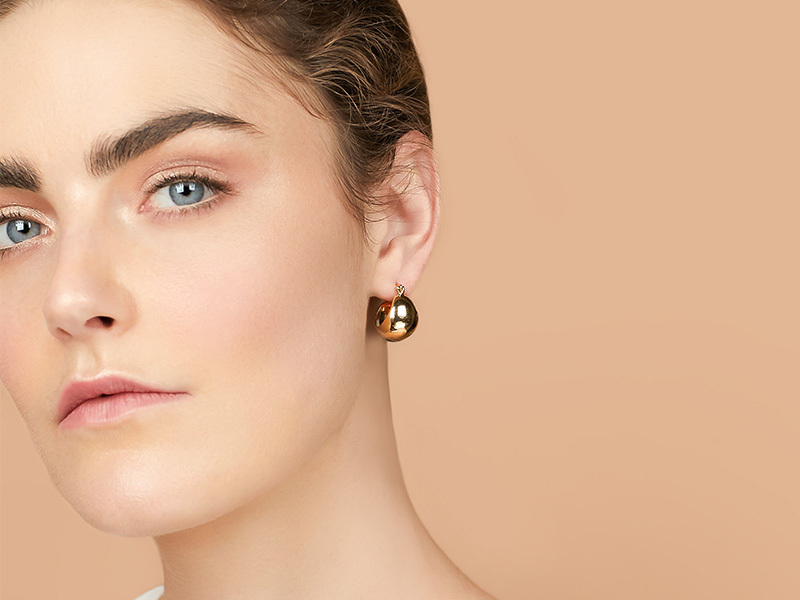 You probably knew already that mismatched earrings are a trend, but guess what? Ana Luisa has combined two trends and the result is a gorgeous pair of unique hoop earrings. These freeform hoops are simply fabulous. Add a cool vibe to any outfit by wearing these mismatched hoops. Want to get some styling inspiration? You are in luck then because we are about to offer you some. A cartoon graphic tee and a pair of ripped jeans will look extra hip with these unique hoop earrings. Wear your hair up to let the different designs be visible and put on a pair of oversized sunglasses to get a fashionable effect. 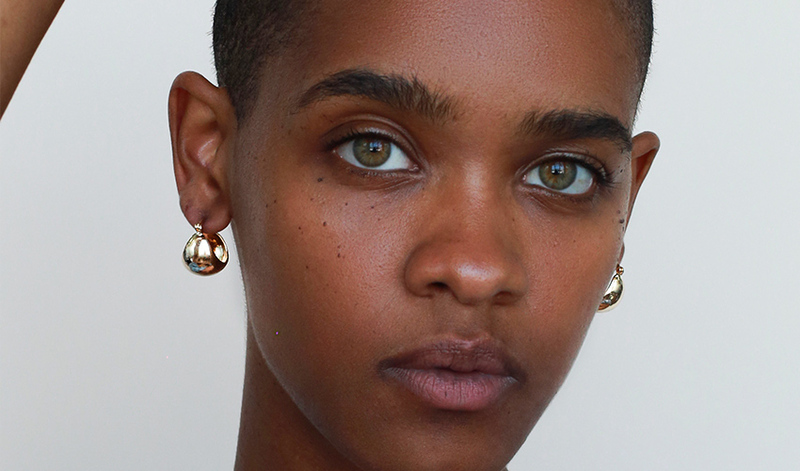 Add these mismatched hoops to your jewelry box to up your earring game. For those of you who want to wear elegant hoop earrings and show off a classy vibe, Ana Luisa’s Abby earrings are perfect. With a brilliant gold color and a lovely design, these thick hoops are also delicate and feminine. They are not your classic hoops, but a unique design that you can wear to work or even to a formal event. What other jewelry can you wear with these unique hoop earrings? Well, let’s see. A nice idea would be to keep it all-metal and flaunt your gold jewelry. Choose a thin gold collar to match these earrings, a couple of gold bangles and a chunky gold ring. Of course, you can also wear gemstones, but make sure to balance the color of your clothes. 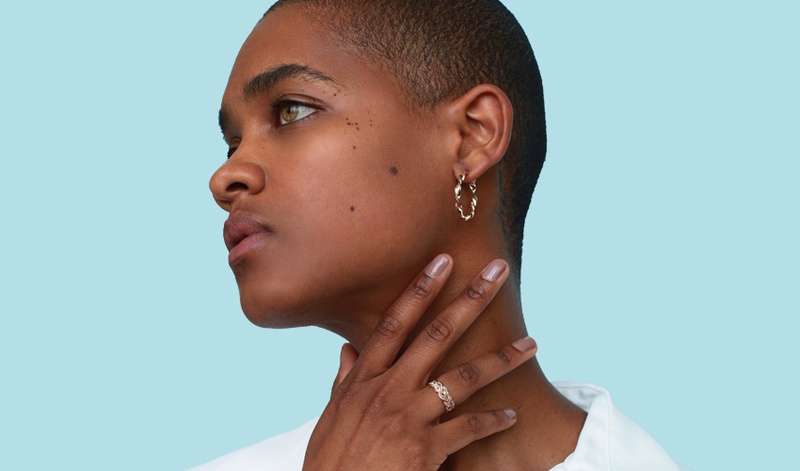 The recipe for success: you take a pair of classic hoops, twist them and create this unique hoop earrings pair. Elegant, brilliant and classy, these hoops are ideal for a fun and confident woman. If you don’t own a pair of twisted hoops, then it’s time to get one because this design is here to stay. With hoop earrings, in general, you have to be careful about the necklace you wear to avoid looking too busy. The same applies to these unique hoop earrings. When wearing Ana Luisa’s twisted hoops, make sure to choose a dainty necklace. You can try a coin design or even a nature-inspired piece. Just be careful to wear a minimal necklace and, if you want to play with geometry, choose a triangle ring. When it comes to your outfit, these unique hoop earrings will look especially good with a velvet A-line dress and a cashmere blazer. Wear simple boots and bring some color to your outfit with a multicolor clutch. Who said hoops cannot feature gemstones? 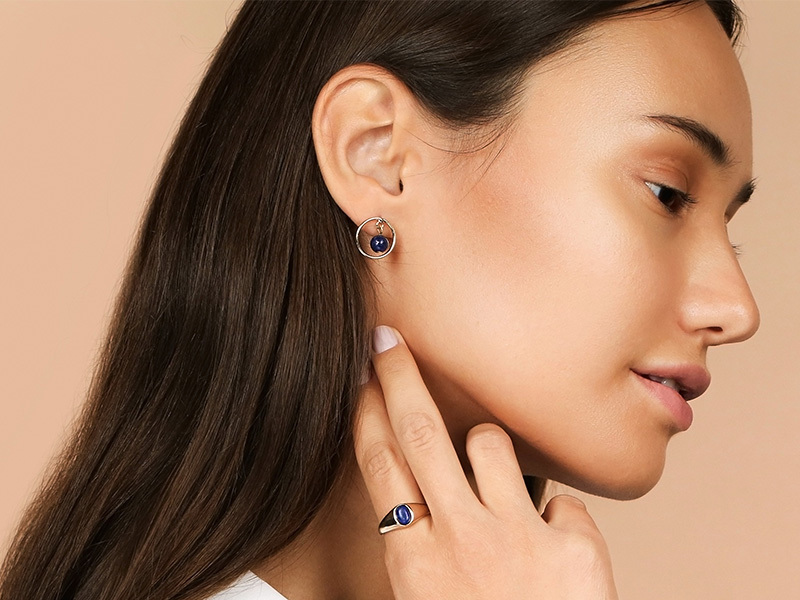 These unique hoop earrings by Ana Luisa feature an inner lapis lazuli gem with a mesmerizing color. They are delicate, feminine and classy and you can wear them every single day. With gold and silver specks, lapis lazuli is a gorgeous gemstone that looks great with any metal. Styling these unique hoop earrings will not be very difficult, but you have to take into consideration the color of lapis lazuli. You can create a theme by choosing a blue maxi dress and a lapis lazuli necklace. If you want to mix and match, try muted colors, like beige, grey, and soft pink. You can wear a layered necklace or stack a couple of bracelets to create a fabulous layered look. 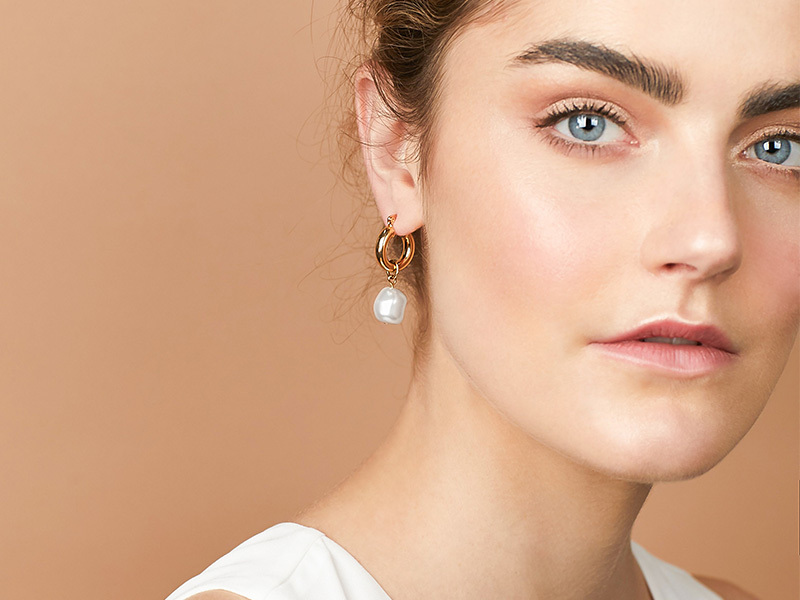 These beautiful pearl hoop earrings are the newest addition to Ana Luisa’s collection. They feature two flawless Swarovski pearls with a high luster and an elegant design. The best part of these unique hoop earrings is that they combine beautifully the pearl drop design with the hoop shape. The result is simply fabulous and we know you can’t wait to try them on. And speaking about that, let’s see how you can style these earrings. Wear your hair up to in a sleek bun to let their brilliant luster grab attention to your face. Pearls look wonderful with precious fabrics like velvet, silk, and other similar textures. A sky blue silk blouse and a pencil skirt will offer you a chic business look. You can also wear these unique hoop earrings to elevate a casual outfit and you can even wear them to a formal event with a sequin gown and a jewel clutch. If you enjoyed reading about unique hoop earrings make sure to check out our other articles as well. We publish daily articles with inspirational ideas, buying guides, styling rules and more. Become a jewelry expert with Ana Luisa’s help and find out how to style and take care of your precious jewelry. To see any of the designs featured in this article and discover more unique earrings for women, visit Ana Luisa online jewelry shop. Each of our jewelry designs is limited-edition so make sure to visit our online jewelry shop today and choose the creations that you love before they are out of stock.